The Great Lakes Fishery Commission convened a first-of-its-kind workshop recently to explore the question: "Are sea lampreys becoming less susceptible to the lampricides that serve as the primary method of control for this destructive invader?" 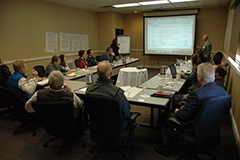 Participants included experts internal and external to the Great Lakes in the fields of microbiology, entomology, evolutionary biology, ecotoxicology, animal physiology, population biology, and fisheries management. Since entering Lake Ontario in the mid-1800s, and the upper Great Lakes beginning in 1921, sea lampreys - parasitic, jawless vertebrates that feed on the blood and body fluids of other fish - have had an enormous, negative impact on the Great Lakes fishery and ecosystem, caused significant economic damage, and changed the way of life in the region. 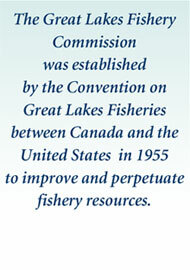 After extensive research to learn about the sea lamprey life cycle and identify control mechanisms, the commission developed an integrated sea lamprey control program that combines lampricides, barriers, and traps to control sea lamprey populations and protect Great Lakes fish. Today, the control program, implemented in partnership with the U.S. Fish and Wildlife Service, Fisheries and Oceans Canada, U.S. Army Corps of Engineers and U.S. Geological Survey, is remarkably successful - sea lamprey populations in most areas of the Great Lakes have been reduced by 90% of their historical highs! The two lampricides, TFM and Bayluscide (also called niclosamide), are the primary weapons in the sea lamprey control arsenal. Discovered in the 1950s and early 1960s after scientists at Hammond Bay Biological Station in northern Michigan tested more than 6,000 different compounds, they have been successfully applied to the Great Lakes ever since. 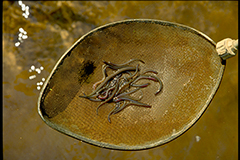 Used to target larval sea lampreys in a stream before the larvae metamorphose into parasitic juvenile sea lampreys, TFM and Bayluscide are incredibly effective, selective to sea lamprey, and safe to use in the environment. While no field evidence of resistance has been reported, understanding the potential of sea lampreys to develop resistance to TFM and Bayluscide has become a high priority for the commission. This workshop was the first step toward meeting that priority and is an example of responsible and proactive management. Based on the current understanding of insecticide and herbicide resistance in plants and animals and on antibiotic resistance in humans, the first objective of this workshop was to determine if a potential exists for sea lampreys to develop resistance to lampricides. The second workshop objective was to identify what measures, if any, are needed to minimize the risk of lampricide resistance. Finally, workshop participants were asked to begin thinking about "next generation" strategies that could be used to augment current sea lamprey control methods. 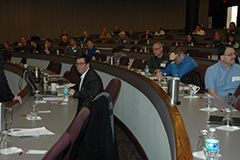 Each theme consisted of invited symposia presentations from subject-matter experts and was followed by small breakout group sessions in which participants were asked to discuss specific questions related to the theme. "The sea lamprey control program is composed of highly motivated, intelligent, forward-thinking individuals," said Sea Lamprey Control Board Chair and GLFC Commissioner Don Pereira. "During the lampricide resistance workshop, I was reminded again of what an outstanding team we have working to protect our lakes. Watching the crew interact with the participants from many other fields of study from all around North America was inspiring: the synergy, the depth of discussion, and the myriad ideas for future collaboration confirmed that this workshop was a successful start to addressing a major unknown in our program." The comments and discussion from the breakout sessions were recorded and will be used to develop two synthesis papers for publication. The first synthesis paper will focus on the likelihood of lampricide resistance development and strategies to reduce the risk while the second synthesis paper will examine research strategies to inform the development of next-generation lampricides. Publication information will be updated here as it becomes available. 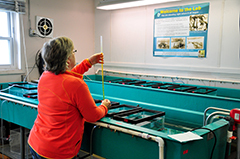 TOP: Lampricide toxicity tests are routinely performed at Hammond Bay Biological Station (and other locations throughout the Great Lakes basin) prior to stream applications. BOTTOM: Sea lamprey larvae are collected post-treatment to assess treatment effectiveness. 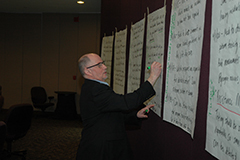 Four breakout sessions were convened during the workshop. Facilitators provided a report out to the larger group after each session.